New manager Mark Eaton wants to see local talent showcased in his Leighton Town squad next season. Eaton took over from Craig Bicknell at the helm of Bell Close last week, but has inherited a club in disarray, with no players to speak of. With Bicknell’s loyal players joining him out the exit door last month, Eaton is calling on former players and local lads to come forward and offer their services for next season. But he admits it’ll be a tough ask to get everything ready in time for the start of the new season. “We know we’re about three or four weeks behind where we really should be,” said Eaton. “We’ve not got a playing squad, but I’m desperate to see some of the local Leighton Buzzard talent out there representing their club. Eaton’s arrival at the clubcame after Bicknell’s sudden dismissal last month. After several years out of the game while he got his business off the ground, Eaton was contacted by former Town boss Sean Downey to encourage him to meet with chairman Terry McCafferty and the club committee about the possibility of taking over. “I’ve been out of the game for a while, but I’ve always been at games, scouted players for other managers, lent a helping hand where I can. “So when the call came, I thought I’d hear what they had to say. 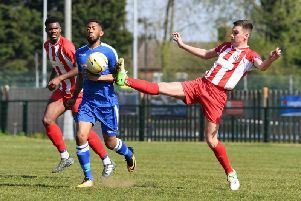 “I knew Leighton Town from my time at Aylesbury, I know the area well and I know the league well. After three seasons of battling against the drop, Eaton, who can boast Aylesbury United, Hemel Hempstead and Arlesey Town as his former clubs, believes there is enough potential at Leighton to see them finish in the top half of the Evo-Stik Division One Central next season. He said: “We don’t want to be at that end of the table any more. This club deserves more. “I’m currently ringing around all my old contacts to see if there are any players available. Eaton is inviting interested parties to a meeting at Bell Close on Wednesday July 1 at 7pm to hear what he has in line for the club over the next season. Trials will take place on Saturday July 4.